Doctor Who 20 oz. Heat Reactive Ceramic Travel Mug:Don't time travel without it! 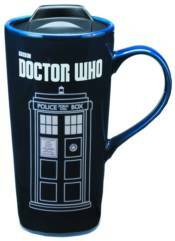 Don't leave home without your favorite beverage and an iteration of the TARDIS! This Doctor Who Ceramic Travel Mug has awesome heat-change properties that show cool images fromDoctor Whowhen you add hot liquid. Holds up to 20 ounces of liquid. Hand wash only. Not dishwasher safe. Do not microwave. Ages 12 and up.